What’s pre-writing? Well, it’s a little bit like “pre-cooking,” in which something is cooked prior to being put in the final recipe, but in food terms it might also be like “cleaning the kitchen” or “grocery shopping.” Outlining is one kind of pre-writing, but so is the creation of that 5,000-word prologue you decide not to keep, but which informed the whole rest of your story. We talk about the different things that each of us do prior to actually laying down lines of prose, and how our processes differ between projects, genres, and mediums. 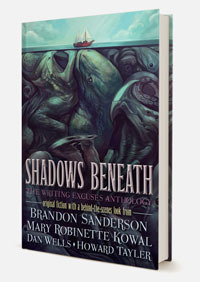 Special Announcement: The first ever Writing Excuses anthology, SHADOWS BENEATH, is available now. This anthology features stories brainstormed and critiqued here on the podcast, and includes draft versions, related episode transcripts, and authorial commentaries as well. Let Brandon tell you more about it! Our critiquing episodes will begin airing next week, so if you want to read ahead, now’s the time to pick up SHADOWS BENEATH. Oh, and if you order the hardcover, you get the ebook free of charge! SHADOWS BENEATH launches this weekend at Westercon 67, where Brandon, Mary, Dan, and Howard are Guests of Honor alongside Cory Doctorow, Christopher Garcia, William Stout, and Bradley Voytek. Loving That Cover Art? Us too! It’s the work of Julie Dillon, who is on the 2014 Hugo ballot for Best Artist. You can admire (and comment upon!) the unobstructed original here in her DeviantArt gallery. Sapient smells. Odors that think. Scents with their own hopes, dreams, and passions. Go. Shadows Beneath, as linked in the show notes, doesn’t have an “add to cart” button. Is the limited edition sold out, or is there a hiccup with the store? Again, I’m writing to ask about when, or if, y’all are going to be doing any kind of box set. You have the first few seasons, but nothing with more current episodes. I’d be interested in buying everything you have recorded to through the last full season. And yes, I’m aware the cost could be steep. I’ll be traveling—without internet access—for quite a while and would love to have these to keep me company. I’ve asked this a couple of times now. I’m sure you all are just not checking the comments. In that case, does anyone know of a better way to ask this question? @Robert: I see an “add to cart” button, so either this got fixed between Q and A, or there’s something wonky. @Joel: It’s in the works. We’ve been busy putting the anthology together. Oh wow! Shadow’s Beneath sounds really, really cool! Can’t wait for WesterCon!! Dan, what kind of bribe would be required to find out which youtube videos you watched for John Cleaver and your other books? Or is that info posted somewhere? I just ordered it. I hope it is a very good learning experience as all books I have physical copies of I use to practice writing lol. I didn’t see an “add to cart” button either the first time I looked, but it’s there now. Must have been added. I had to laugh when I saw how long this book is. Brandon can’t even keep an anthology under 500 pages, can he? I do Mary’s method of the exploratory chapter. I do it as sort of a general tone test and see if the idea itself is sound enough to carry prose, delete it and start it over. I usually do a page for a short story and about 10-20 pages for a novel then just out they go in a “DNU” folder. It usually changes and improves my initial idea pretty radically, actually. Generally, I have to have showered and dressed in real clothes (jeans, non-PJ shirt, socks) before I write. It reminds me that I’m a professional and while I may not be getting paid for it very much yet it’s a real job. I usually ‘pre write’ in my head. Have my chararacters start converstions with one another. Sounds a little loony (Do NOT have them talk out loud, you will get funny looks. :) ) but by the time I’m ready to sit, the ‘crap’ has been worked through. I like the idea of giving characters a job interview. Where do you see yourself in 5 years. Also having them take personality tests etc. Not to mention having the character come up with their elevator speech. A sapient smell? The idea sounds clever but I am completely stumped as to what an odor could possibly want or be capable of doing without making it a generic (invisible?) gas monster. Love the pre writing exercises. I never used to consider it partof my overall process until I realised how important it is. I just wanted to point out that these pre-writing techniques work for non-fiction too. I write journalistic articles, academic articles, and other non-fiction, and I totally do research and outlining, and I typically have bullet points at the beginning of each section if it is a longer article. My tone text is typically other articles from the periodical that I am publishing in, which helps me keep their audience and vocab level in mind. Finally, pre-writing about the character comes into play any time I am writing a piece on a particular person. In this case, I will write my notes from their bio and interviews into a narrative format to give me a picture of the person. Most of that does not actually go in the article. I am in the process of reading the anthology. It is amazing. I love it. It is a great ressource for writers. I really hope it won’t be the last time Writing Excuses releases an anthology like thia one. Also, concerning the lenght. It is 500 pages because of the bonus materials. Some of those are first drafts which take a great deal of space. @Samuele: Thank you! I’m glad you’re enjoying it. If this is successful (read: “pays for itself and turns a profit”) we’ll certainly be doing more. It was a lot of fun, logistical headaches notwithstanding. Mary: by “cool set pieces” do you mean like how Dumas tied the politics of the restored French Monarchy and Napolean’s Hundred Days into Count of Monte Cristo, and the Ali Pasha plotline? Or do you mean more literally as in using authentic places in the story (which Dumas also did, according to my copy’s foreword) ? Or something different? Dan: what movie was it you used? I assume at that point, it would be the John Wayne Cleaver books. Which really narrows down the type of music vid. And that writing prompt – technically an odor is a mist of aerosolized (not personalized, spell check…) compounds, generally organic (that is, carbon based, not necessarily alive). So we’d probably be working with some manner of hive mind bacteria that’s light enough to be carried on normal air currents. Now the remaining questions are: what happens when you inhale the collective, and does the collective have anything it wants beyond consuming everything? Of course, I’m thinking from a science fiction perspective here, but to fantasize it, all you need is to inject a population primitive enough to think it’s a ghost or a god rather than a hypersophisticated bacteria colony. I believe that she’s borrowing the definition of setpieces from film, basically, “elaborate pivotal sequene or scene.” So, that part of Mary’s prewriting is about jotting down notes on potential definitive scenes enabled by a potential worldbuilding element. Something like “My story’s in Venice! We have gondolas! Let’s have a gondola chase!” Or “we have an orphanage in the shadow of an active volcano! Let’s dramatically rescue some endangered children!” I guess it works for nonviolent happenings too. “This would be a perfect place for a heartwrenching breakup!” is the first thing that comes to mind. Also in the archives, for those who prefer that route. Aside from the actual stories (which, if Mary’s is an indication, will be great), this really is a great way to go through the process step by step. In other words: Great idea, guys, thank you very much! ‘Shadows Beneath’ sounds to me like the world’s best worked example – I’m totally up for that. @Rashkavar – my limited research indicated ‘volatilised’ which, to me, sounds like a more natural state than ‘aerosolized’ – either could be true depending on ones chosen set-up, of course. On the basis that gas occupies a much greater volume than the same substance in a solid state, I’m thinking that these are very large beings, drifting on the winds. On that basis, inhaling a few (hundred?) molecules (smell being active at low concentrations) would have no effect on the being itself. To me, this has the feel of the great SF that I grew up with by the likes of Bob Shaw (e.g. Wreath of Stars). Nice prompt, Mr. S.
@Rashkavar Cory has it. I come from a theater background and still fall back on familiar jargon. @Robinski, volatilised means evaporated (turned to gas). Aerosolised means still solid or liquid, but small enough to float around in the air thanks to tiny air currents. They are different things. Also, inhaling small particles CAN affect the inhaler – consider cold viruses. I would love to see John Cleaver’s monologues.